Green rose is a sweet high quality fragrance that is one of our more popular fragrances. Stick length is about 8 inches. I use Incense during prayer and when I do this with a good incense I get extra inspired. This is a very nice incense. I have been around a lot of incense burning trough the years and for me to give 3 stars means that I really like this incense. Green Rose is a great scent that I never get tired of. Itâ€™s a pleasant fragrance that renews your spirit. Itâ€™s a great gift item also! This incense has a unique floral aroma and is long burning. I have been burning Green Rose incense since 1986. I burn other scents, but I always go back to this wonderful item. I keep the package open and it scents the whole room (even when it's not being burnt). I highly recommend this beautiful incense. Great price too! 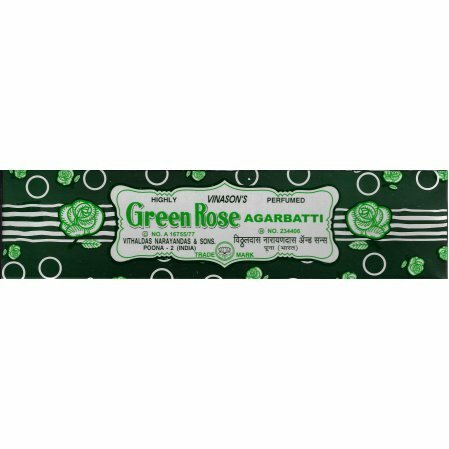 Green Rose Incense is the smell of heaven. I have gotten Green Rose forever. My friends love it and I like buying it for gifts. This is~by far~the best incense, the only incense I will ever use. Thank-You! I will use nothing else but Green Rose...nothing compares. It is the best incense I have ever found and I have been getting it for decades! I found this scent underwhelming- almost hard to detect. It's the first time I tried it, and I probably won't buy it again. I'll order the Vedanta Special when it comes around again. I love this product it's my favorite incense, hard to fine here in San Diego. Thank you so much for your quick service. This has a lovely gentle aroma. It is one of the few brands that don't ever give me a headache, which makes me think that it is very natural.